EPIC went to INFINITY and beyond! 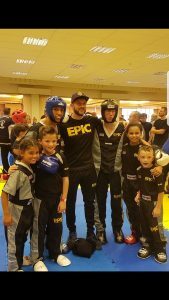 On Sunday 24th September EPIC martial arts visited the much anticipated 2017 edition of the Infinity & Beyond competition. The competition was moved from its previous location in Yeovil to a place closer to our home location so we took a decent sized team down there! It was also a good turn out for our instructor team, with most being available. The club recorded a haul of 35 medals on the day with 12 being Gold, 11 silver and 12 bronze. 26 of the 35 medals were for points fighting and 9 of them were for light Continuous as well as both of our junior teams reaching the final of the teams event. Congratulations to Harvey Tyler, Teia Doyle and the captain Kam ‘jedi’ Doyle for taking the £150 cash prize money and winning the team event. Well done to our other team Harvey Pollard, Ellie Doyle and Brooklyn James for beating all other opponents and setting up an all EPIC final. 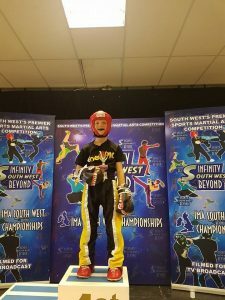 Connor Chapman overcame nerves to come through his -4 ft 10 novice points category to win gold and went on to claim a bronze in the same category at intermediate level. His younger brother Ryan Chapman demonstrated a good reading of the points game as he took a bronze in the -4 ft 6 novice points category. Alex Fellender-Evans took a gold in the continuous -4 ft 6 category as his slick movement and crisp combinations helped him to finish his fights in the judges favour. In the same category but for points he came close in a tense final but narrowly missed out and took silver. Teia Doyle did a great job in her categories on the day, winning 3 gold and a silver on the day. She also was part of the winning junior team. Her second gold came in the -4 ft 2 points, her final gold came in the continuous -4 ft 2 category and her silver came in the -4 ft 6 points category. Ellie Doyle took a clean sweep of the medals chart as she took a gold, silver and bronze in her categories before claiming a silver in the teams too. She took a gold in the -5 ft 2 points category, her silver in the -4 ft 10 points category and her bronze in the -5 ft 2 light Continuous division. Sean MacDonald came through his opening fights in both the intermediate and advance categories in the -4 ft 6 section but unfortunately couldn’t beat his second opponent in either. George Sherlock took a bronze medal in the -4 ft 6 continuous division but didn’t place in his points category of the same height. Oliver Hiscutt took a bronze in the -4 ft 6 Intermediate section but didn’t manage to place in the advanced version of the same height. Harvey Tyler had another good day at the office as he took another 2 gold medals in the junior teams and his points category respectively. That totals 25 golds for the year now! He then went and added 2 silver medals, narrowly missing out in both of his continuous categories. Ellie Doyle takes centre stage with Jess and Rhiannon in 3rd! Jess Andrews added a silver and a bronze medal to her previous nights win (at Total Valour). Her silver medal was in -5 ft 2 light Continuous category and her bronze was in the -5 ft 2 points category. Dean Andrews didn’t place in either of his categories but did manage to perform well. He was still buzzing after his win at Total Valour 5 the night before. 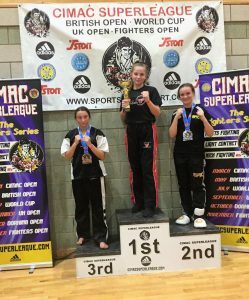 Emma Thomas took a clean sweep of the medals too as she claimed a gold in -65kg mixed ability ladies Continuous, a silver in the -65kg novice ladies points category and a bronze in the +65kg novice points category. 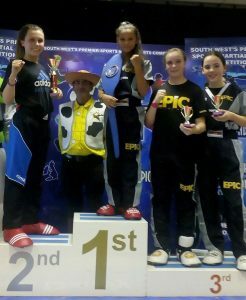 Alisha Miles took a gold by hammering her opponent 7-3 in the -5 ft 2 novice points girls category. Connor Mitchell lost 5-4 on the buzzer in the men’s -75kg advanced division in a close bout! 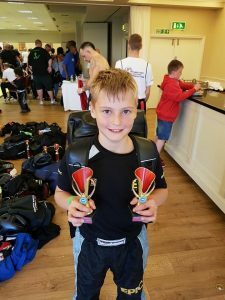 Lenny Tindall lost 11-7 in his first external competition fight which is a great effort for the 6 year old. This was in the -4 ft 2 novice points division. He also fought gallantly in the mixed ability -4 ft 2 continuous section and made his coaches proud. Brooklyn James took a silver in the team events, beating all of his opponents with ease before having to come up against the Jedi, Kameron Doyle, in the final. Tyrese Redgers showing off his winners trophy! Filippo Figari stunned spectators with his quality performances as he stepped out of the interclub scene for the first time. 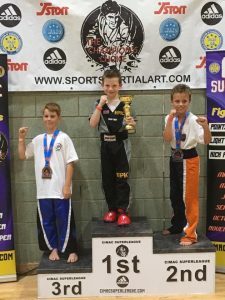 He took silver in the novice -4 ft 10 light Continuous section, he lost a tough first fight against a hard hitting opponent in the novice points section but went one better in the intermediate section narrowly missing out on a semi final place. Finlay Cozens took bronze in both the -4 ft 10 advanced points and continuous sections. His strength and determination are shining as he gets ever closer to dominating these categories. Kailem Mulligan earned himself a bronze in the -4 ft 6 novice points division and was unlucky not to place in the -4 ft 6 advanced points and mixed ability light Continuous category. Peter Lonsdale overcame tough opponents on his way to a silver medal in the -4 ft 6 novice division and added a further silver in the -4 ft 10 mixed ability Continuous category thereafter. He didn’t place in the -4 ft 6 advanced points category. Harvey Pollard showed steel and determination taking gold in the -3 ft 10 points category and added a hard earned silver from the -4 ft 3 continuous division. He didn’t place in the -4 ft 6 advanced points section. 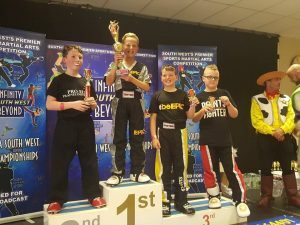 Tyrese Redgers won a gold in the intermediate -5 ft 2 light Continuous category as he dominated his opponent in style. He added a bronze in the same standard and size category but for points. Rowan Redgers got to the 2nd round of his mixed Continuous category and was unlucky in his points division not to make it to the podium. The team will next be performing at the Dorking Cimac Open. https://epicmartialarts.co.uk/wp-content/uploads/2013/04/logo-fat1.png 0 0 Andy Cleeves https://epicmartialarts.co.uk/wp-content/uploads/2013/04/logo-fat1.png Andy Cleeves2017-10-03 15:46:102017-10-03 18:02:15EPIC went to INFINITY and beyond! 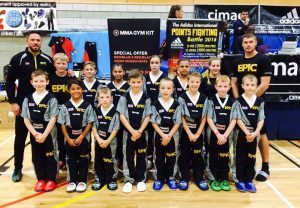 EPIC took a team to the Cimac on September 17th at Windsor and had a great medal return of 21 medals from 17 fighters with head coach Andy Cleeves and senior coach Matt Roberts as coaches. In semi contact points fighting we won 6 gold, 2 silver and 5 Bronze medals. In light Continuous we took 2 gold and 6 silver medals from our team of fighters. Alex Fellender-Evans claimed gold in the -28 light continuous category and added a further bronze medal from the same weight division in points. Harvey Pollard kept up his ‘pingu power’ by claiming a gold in the under-7-years points category. He then narrowly lost out in the final of the light contact and took a silver. Oliver Hiscutt got better and better as he went through his -36kg points category, needing a last gasp winning technique in his opening round. He then went about dismantling his opponents as he got through to the final and claimed gold in style. 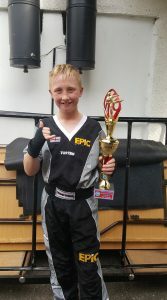 Harvey Tyler added more to his comprehensive trophy cabinet as he took gold in the -30kg Points category. He added 2 silver medals in the -32kg and -34kg categories in light continuous. George Sherlock took the silver medal in the -30kg points category and which was a competitive fight against above mentioned teammate Harvey. Harrison Doyle took one of each type of medal, winning gold and bronze in his points categories while the current European champion took a silver in light contact. Ellie Doyle also took a gold and a bronze in points and added a further gold in light contact. Teia Doyle took a silver in her light contact category and a bronze in her points category. Team Doyle adding a total of 8 new medals to their vault of bling! Rhiannon Bater performed at her best and was rewarded with a strong silver medal in -45kg points and having to retire in the final through injury but had already claimed a gold earlier in the day in the -45kg points category. Aaron Mountford took a bronze in the boys +52kg, cementing his rise from beginner to comprehensive competitor in such a short space of time. We would like to congratulate everyone who competed on the day, those who didn’t place were back on the mats the day after and prepared for the following weekends’ Infinity Competition.